Lino Brocka’s Insiang stars a very young Hilda Koronel, but what the opening and closing credits forgot to cast were Koronel’s eyes, two large orbs that convey so much emotion in each scene. Yes, Nora Aunor still takes the trophy for acting with one’s eyes, but Koronel as Insiang comes a close second. 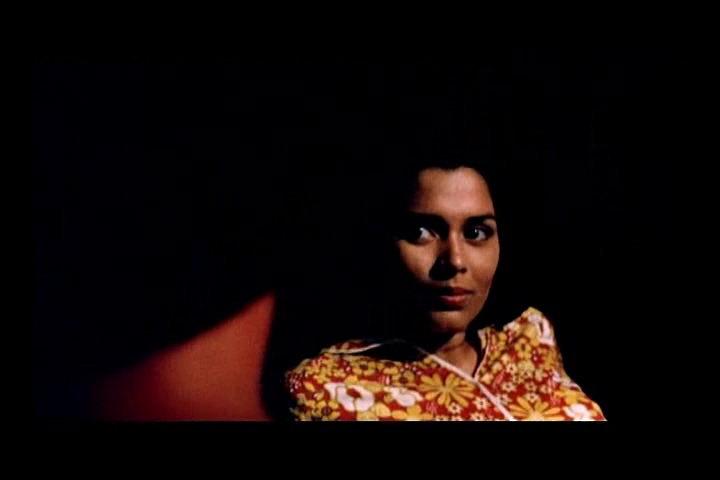 In this 1976 film, Koronel has scenes where she has to smile with her eyes, a subtle yet crucial move that hints at how she has grown from her first appearance. Insiang tells the story of a young woman living in poverty who takes revenge for all those who wronged her, like her overbearing mother, her lecherous boyfriend, and her mother’s lustful lover. At first, Insiang is a dutiful daughter, taking the brunt of her mother’s rage like a typical Filipino woman, but she quickly becomes jaded. You see this when she first smizes (first picture). I would have loved to see this in the film’s final scene, and was disappointed to read that Brocka originally ended Insiang with Koronel gloating over what happened to her mother, but that Marcos-era censors didn’t like it. The director was forced to change it to something more melodramatic, but Brocka added a little easter egg: instead of ending the film with a triumphant Insiang, she is indifferent… until she fades to black. The film is such a masterpiece that it is the first Filipino film to be screened at the Cannes Film Festival, where it was shown at the Directors’ Fortnight in 1978. It was screened again earlier this year at the Cannes Classics section.